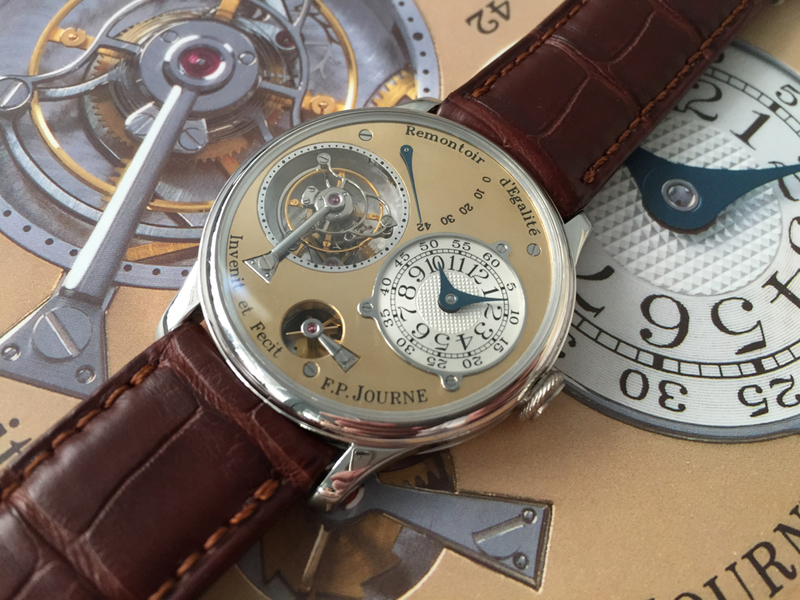 TimeZone : FP Journe » A Tale of Three Watches - "Patience"
Once I owned the Resonance, all bets were off and owning the tourbillon seemed like a remote possibility. Something that could happen some day and was no longer impossible. 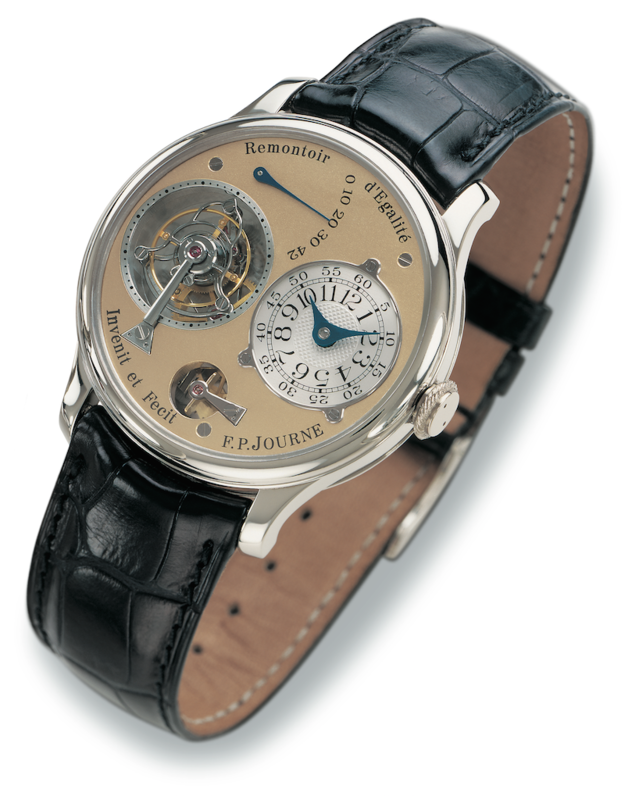 I had this vivid daydream of having both the Resonance and Tourbillon as the ultimate Journe collection, one for work during the week and one for the weekends. F.P. Journe introduced a slight wrinkle in this plan. 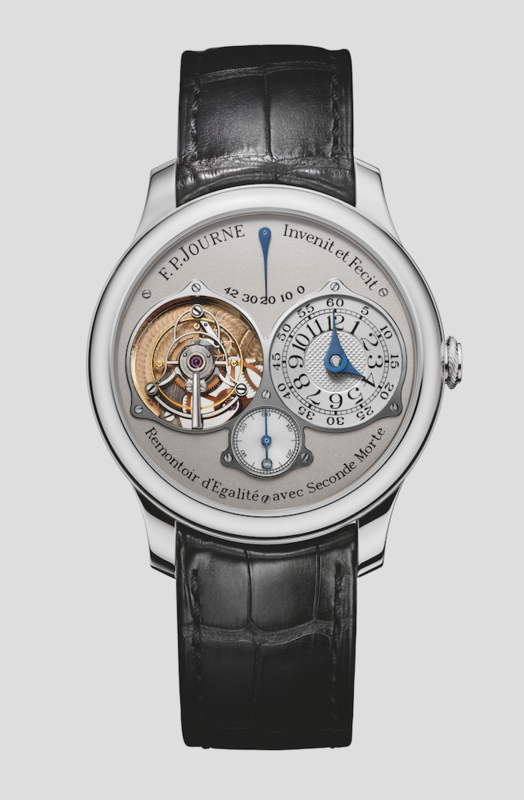 In 2004 he introduced the dead seconds tourbillon with rose gold movement and discontinued the original tourbillon. The dead seconds version was a lot more expensive, pushing the achievability of my goal out quite a bit. The longer I waited the harder it would be to find one. 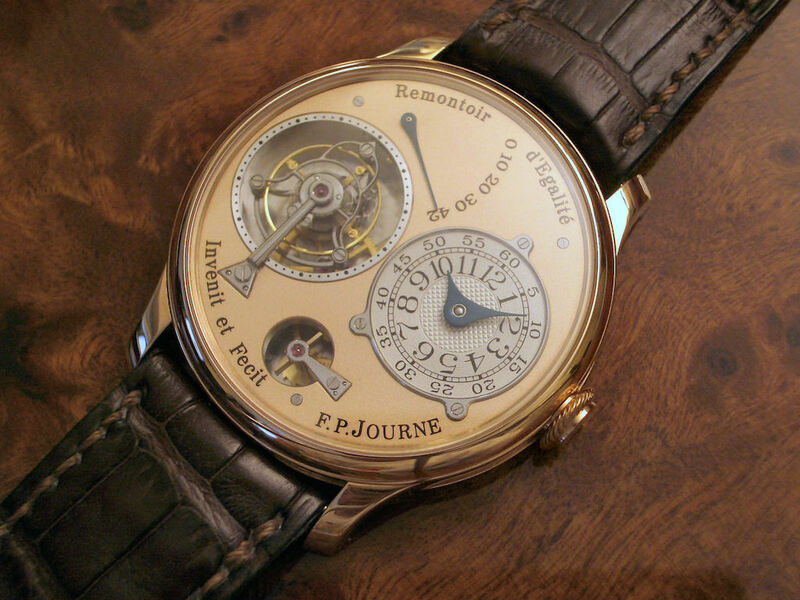 A few months later, after buying the Resonance, I saw a second hand dealer online had gotten a rose gold tourbillon with rose gold dial. Better yet, the price. It was conveniently about the same as I had saved up in my investments. Investments that were earmarked for buying an apartment. Investments that I shouldn't touch, especially for a watch. Well, they got touched. Big time. The watch was put on hold as I liquidated all my savings. After waiting for funds to clear, then transferred to my bank account, then wired to the dealer, I finally got it. I could not believe that what was merely a dream a couple of years back was now reality. And I owned a tourbillon. This was something so inconceivable when I bought my first watch that it took a few months for the notion to sink in. In addition to sinking in, my little quibble with the dial came to the surface. 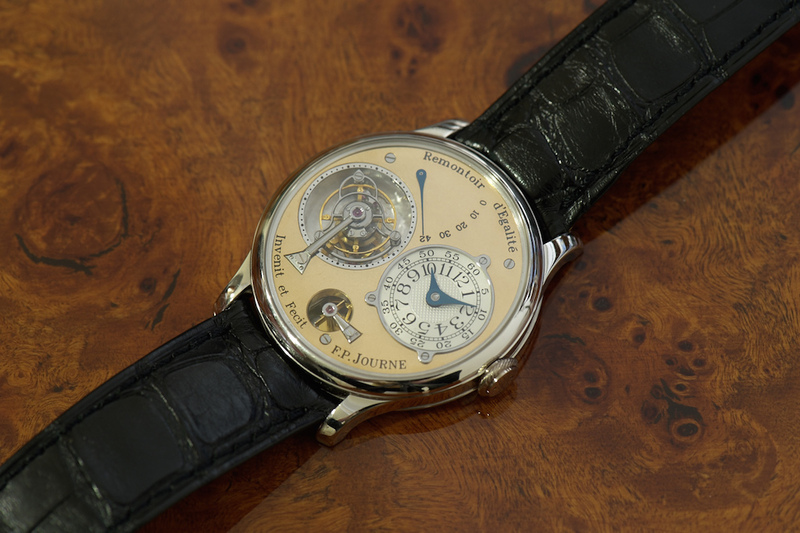 This watch had a flat rose gold dial and a matte white subdial. It started to bother me. The other thing that bothered me was that I really preferred the platinum case with yellow dial. 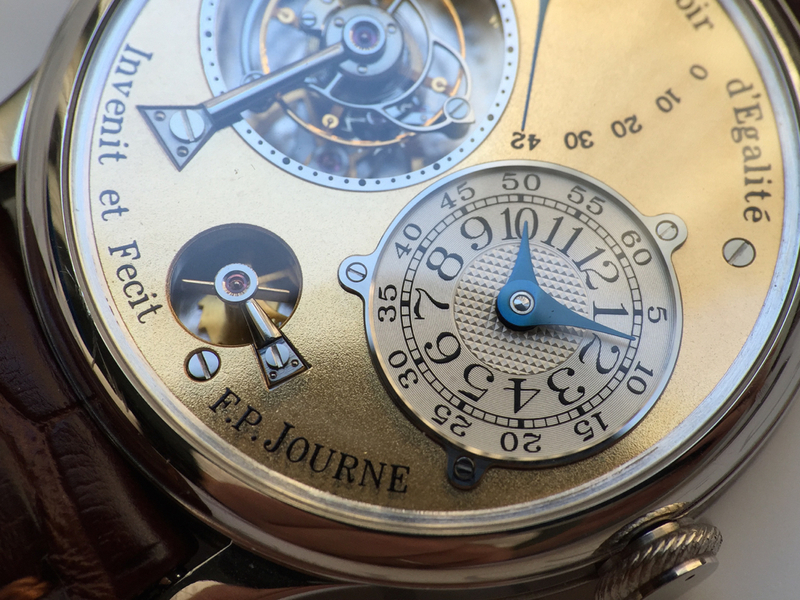 To me that was the Journe look. My watch was like getting a Ferrari in green instead of red. From a collectible standpoint it made sense though, because the rose gold version was the rarest. 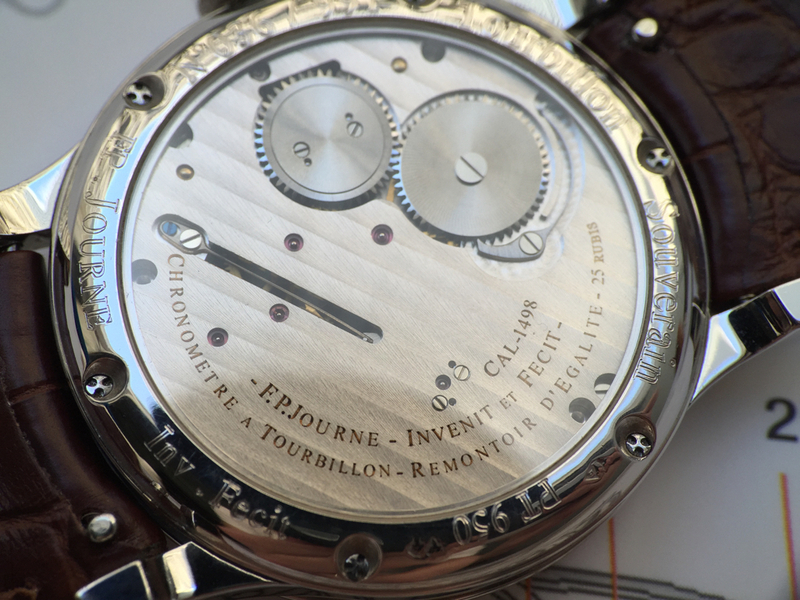 After a lot of back and forth I sent the watch to Montres Journe to get the subdial changed. For a fee, of course, but it was great that they even did it. A few months later I had the watch back, and it was indeed beautiful with the silvery dial. I thought that would be it, and I would be happy now. But I wasn't. I wore the watch mainly on the weekends with a brown strap, and it was just very pink. The pinkness would yell at me whenever I looked at it. It did look good in certain lighting, but most of the time it was too much, and not me. I missed the contrast I had in the Resonance. I thought of changing the dial from pink to white, but after some consideration I figured I should go for the one I really wanted, the one with yellow dial in platinum. That's where a whole lot of patience had to come in. I did not want to run the risk of losing the watch. I could sell it but there was no guarantee I would find another one. And if I found one I don't know if I would have the money. 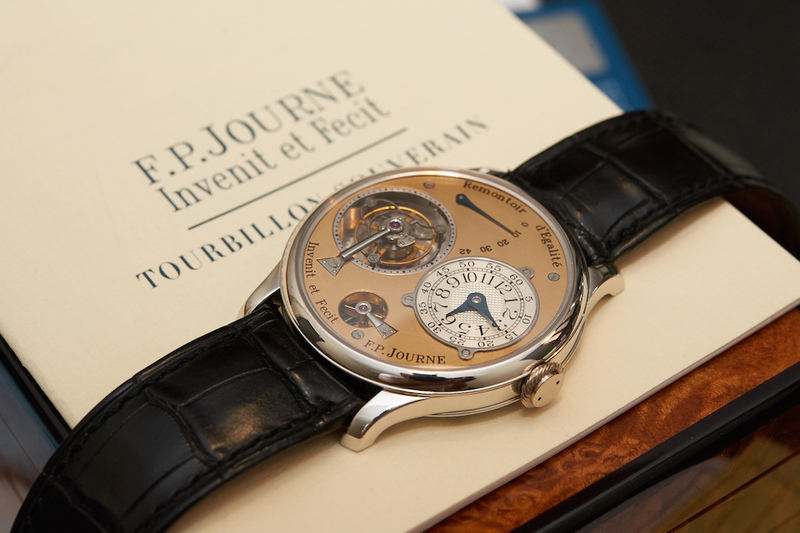 In the end I wanted to keep my Journe tourbillon because it took some effort to get here. So I put it up for trade, for an early model in platinum. And I waited. Finding one to purchase was impossible at the time. They were nowhere to be found. And then finding someone who had the one I wanted and would take mine in trade was even more impossible, if that's possible! Maybe I should have titled this story Luck as well, because that's exactly what happened. It did take over a year of trying, so I think Patience won out. A good friend of mine in Hong Kong found a collector for me who was interested in my rose gold version for the rarity, and he had a very early one in platinum with a gorgeous yellow dial. I was very excited when I got a blurry cell phone photo and could make out the large screws on the dial, a sign of an early piece. 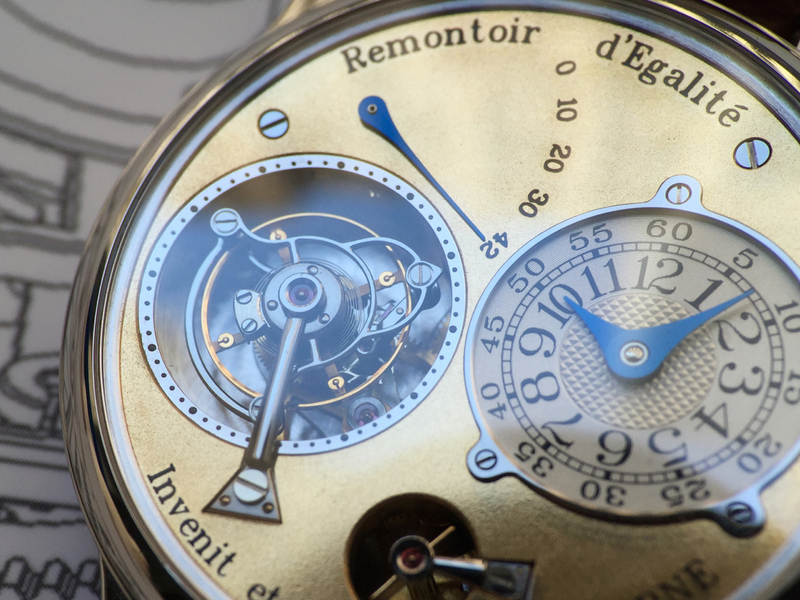 It was so early that when I later showed it to François-Paul he commented that it was one of the dials that he had finished by hand. I didn't know this type of dial even existed. There was just one small problem, the guy wasn't sure he wanted to do the trade. I think it took a month or so of convincing. It was tough because my friend did not see this guy often and did not have much contact. I could not get in touch directly because of the language barrier. 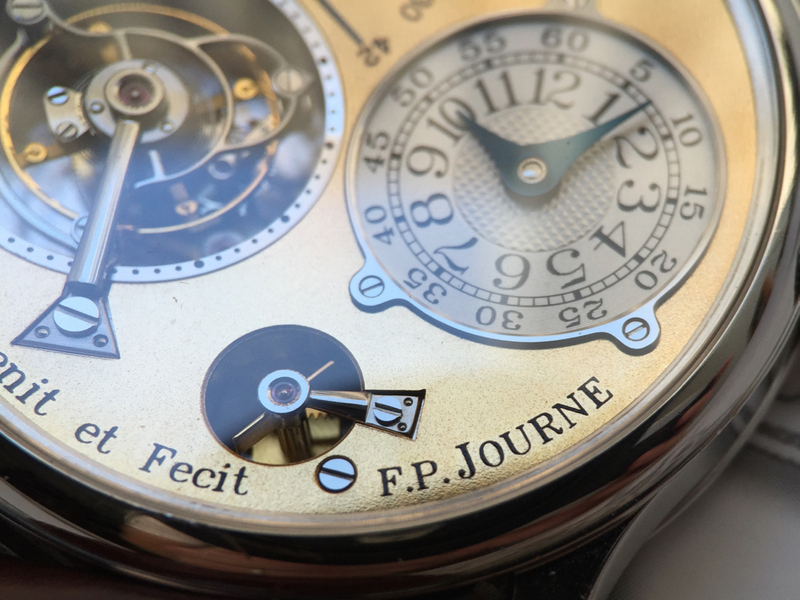 Maybe the Journe fairy was watching over me because he eventually agreed to do the trade. But now there was another problem, and the reason he agreed. The watch was broken. I went ahead anyway, it was just too good to pass up and I could always send it in for service. Although I would have to wait a bit because any money I had in the watch budget was used to pay a little extra in the trade. I had waited for a year, I could wait a little longer before wearing it. I was happy just to have it. I don't know what happened, but during transit it started working again. Maybe giving it a little nudge was all that was needed. I did eventually have to send it in for service though because the remontoir blade needed tightening. 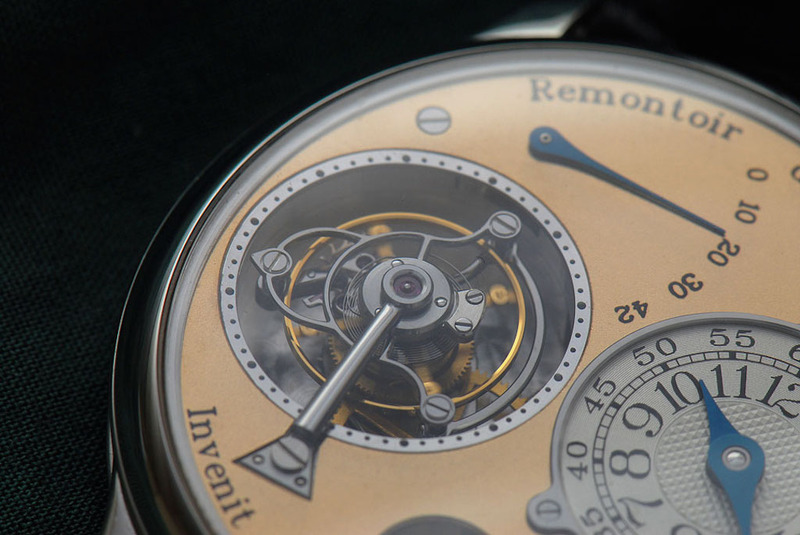 You could tell because toward the end of the power reserve the little remontoir propeller would turn smoothly instead of clicking. So patience here paid off. I had my two special pieces exactly the way I wanted them. 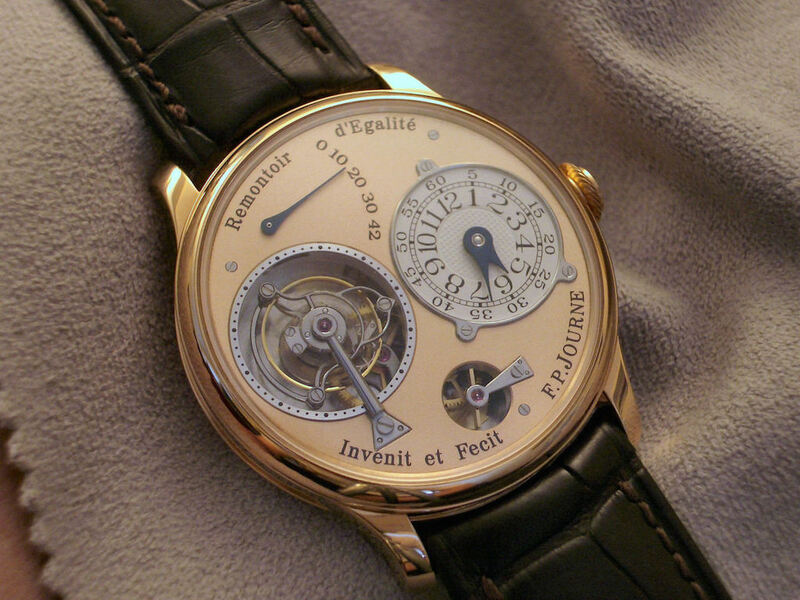 After getting it on June 21st, 2005 I wore the tourbillon every day to work for many years, replacing the Resonance that I used then for travel and the weekends. I since met the original owner who had bought it here in the USA, it was one of the first pieces to come to the States. It was also the only watch he ever recalled selling. It's a small world, especially when Journes are involved. There was a third watch though, one that was part of the original collection. Wouldn't it be cool to have it? The thing is, it didn't make sense. When would I ever wear it? I had two Journes that covered the same ground and look. It was a silly daydream.